The Right Brain was born in February 1999 with the first issue of The Wright Stuff, Wright Engineers' monthly news. Each month since, the Wright Stuff has featured a construction industry-related cartoon usually tied to an article in the newsletter or to a current event. Many of them are posted on this site. If the Right Brain was born in 1999, then it was conceived nearly 25 years earlier when a much younger Right Brain-in-training sketched a collection of cartoon athletes called "Verbs" (men of action inspired by the PBS TV children's show The Electric Company) and "Turkeys" (their scrawny opponents). . 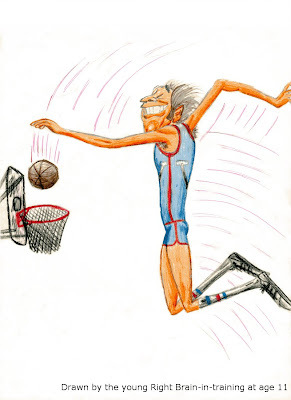 The drawing at left shows a Verb basketball player doing what the Verbs do: winning and making it look easy. 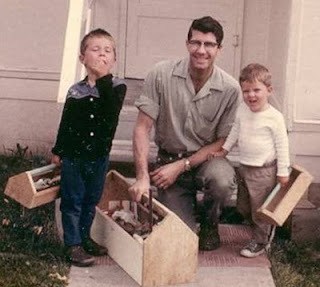 The young Right Brain (below in black shirt) poses toolbox in hand with his dad, Leo, a carpenter and general contractor (now retired), and younger brother Darin (now a chiropractor). 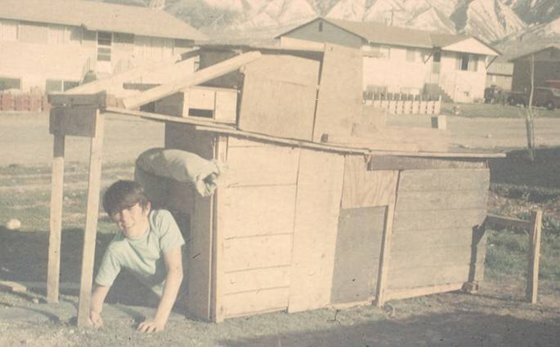 A slightly older Right Brain (below left) demonstrates the easy access in and out of one of his many prototype construction projects.